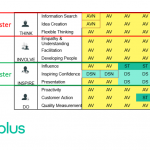 We claim that the my360plus 360 team development data is better than the rest. How outrageous! How can we say that? We’ve all seen team reports created from 360 data – you know the ones – they say your team scores 2.8 on a 5 point scale on a particular behaviour. If you are lucky there will be some ‘norm data’ so you can see how you team ‘compares’. The problem is that these reports average a bunch of statements around an individual team member’s behaviour. They then take a further average of all these averages to come up with the ‘team average score’. All this averaging averages means that the really valuable information is lost. We think this is a little bit like averaging all the notes in Beethoven’s 5th Symphony, so you come out with a single “daaaaaaaah”! Pretty meaningless. my360plus team reports are very different, which means you get better business insights. my360plus team development reports help you ‘see’ the strengths and development areas of the team, which means how these strengths are made up. Where the undeveloped areas are. And what the team distribution is. Works for groups too – so you can improve the chances of a collaboration being successful. This is because my360plus creates individual profiles by looking at the consistency of observations of different levels of particular behaviour to create an individual’s rating. These team profile ratings go side by side with the individual profile. We then use ‘gravity’ to pull the least developed area left and the most developed areas right. The result? 360 team development, with clear team profiles, which mean you can ‘see’ what’s going on. Reports that retain the richness of the team or groups strengths. And these views work equally as well with a team of 6 or a company of 6000. Are you getting the 360 team development insights you need? With these charts, teams can see why they are interacting the way they are, so they can see why they are getting the results they are and more importantly why they are not getting the results they want! It’s a simple, proven high-performance leadership model, so it’s easy for people to understand what’s expected of them, and to see those behaviours and strengths in the team around them. If you’re not getting the team development insights you need, get in touch, because we’re confident my360plus will make a difference. To get better insights into peoples’ strengths and talents, the 360 you use for team development matters. We get insight in how to develop them, and insight into who to recruit to fill gaps and improve performance. Here at my360plus we believe in giving it to you straight, and making it easy to build your in-house leadership capabilities. We also make recruitment more targeted and better value because you get the 360 team development data that really matters. For thoughts, news and information subscribe to our thought provoking email: my360plus INSIGHTS.